About Us | Sault Printing Co. 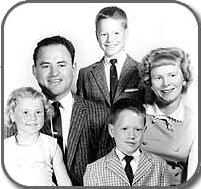 In the 1960s Theodore (Ted) E. Maleport was employed as a pressman by Stan and Ann Pratt- owners of the Evening News. Ted soon became interested in owning his own printing company and in 1969 his opportunity came. Ted purchased the newspaper's job shop, then known as Sault News Printing. At first, Ted's business had only a few presses, one small rack of office supplies and a staff of two-himself and a clerk. Envelopes were printed on Kluge "crash printing" presses using lead type. Small cards composed with lead type were printed on hand-fed presses, while other jobs were printed on small offset presses.With the passage of time came changes in printing technology and Sault Printing kept pace, growing and changing with the industry. Two offset printing presses. 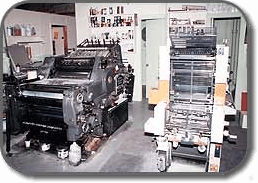 In the 1970s newer and larger offset presses-including a Heidelberg Kord-were purchased, and Compugraphic typesetting equipment was introduced into the work flow. 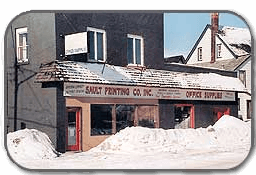 Sault Printing became a true family business when Ted's three children started working part-time while in high school, and then full-time after graduation. Several employees were hired as well, to help with the growing business. In 1993, two houses were purchased and demolished at the North end of the building and a new addition was constructed. The expansion doubled the size of the facility. 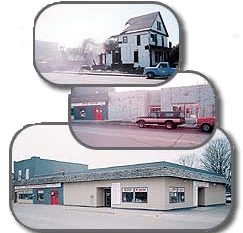 In 1983 Ted's wife Barb left her job of twenty years at a local bank and assumed the duties of Secretary and Treasurer for Sault Printing completing the involvement of the entire family in the business. During this decade a 2 color Komori Sprint press, an Itek 2 color press, and a computerized cutter were purchased. These machines added two and four color print capability as well as larger sizes and quantities. Continued growth of the business enabled a doubling of staff size. Throughout the late '80s and early '90s, digital typesetting became the industry norm as personal computers and desktop publishing software grew increasingly sophisticated. Again at the forefront of these industry changes, Sault Printing invested in the digital revolution and a new prepress department was created. 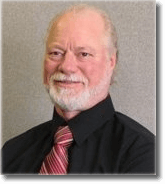 "Sault Printing has grown and changed with the printing industry but has never outgrown its family tradition of quality and service." The 20 x 26 Komori 2 color press is delivered. At the core of the prepress department is a Macintosh-based computer workstation network which incorporates an ever expanding software library. With the addition of scanning and imagesetting capabilities, the prepress department was complete and Sault Printing was able to dispense with its traditional reliance on service bureau outsourcing. 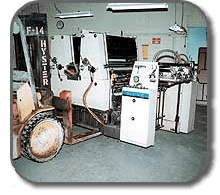 In 1998, another 2 color press was added to help with the increasing amount of color work that Sault Printing was producing. Ryobi 4 color press is delivered. By 1999, the amount of four color work had increased dramatically, and the need for a 4 color press had become apparent. 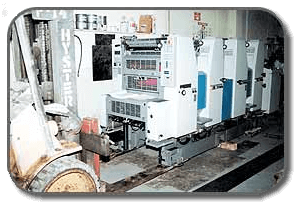 Therefore, in October of 1999, a brand new Ryobi 524HX 4 color offset press was ordered. Installed and ready for production in January of 2000, this press allows Sault Printing to offer higher quality, faster turnaround and even more competitive pricing. Today, with a staff of experienced and dedicated employees, Sault Printing offers full service printing, a complete line of office supplies and furniture, and the latest technology in business machines featuring Ricoh copiers. 1969 - Sault News Printing purchased by Theodore Maleport. 1970 - Newer presses purchased. 1970 - Ted's children began working at the print shop. 1978 - Compugraphic typesetting equipment purchased. 1979 - Heidelberg offset press purchased. Staff increased. 1982 - Office supply department expanded to include a full line inventory. Staff increased. 1986 - Komori 2 color press purchased. Computerized cutter and 2 color Itek press purchased. 1987 - Office equipment and service department added. Staff increased. 1988 - Computers purchased for typesetting. 1993 - Building addition and expansion completed. 1995 - Macintosh workstations installed. Ricoh office equipment added to inventory. 1996 - Imagesetter and scanner installed. 1998 - Third 2 color press installed. Labeling and tabbing machine purchased for mailing services. 2000 - Ryobi 4 color press installed. Mac workstations upgraded. 2001 - Online office supply ordering system installed. 2003 - Wide Format Copier Installed. Computers upgraded. 2005 - Service Department staff increased. 2007 - Booklet Maker Installed. 2008 - Ricoh Color Copier Installed.